Get ready for an amazing experience with Chef Jack at your cooking class this morning! During class, you'll learn how to make Pho (Vietnamese noodle soup), Grilled Lemongrass Pork, and Shrimp Spring Rolls. We begin with some simple preparations for making the broth for the traditional Pho soup. Then, we'll hop into some cyclos (three wheeled bicycle taxis) and head to the Dong Xuan wholesale market, where Chef Jack will teach you to buy the ingredients for the rest of the meal (especially how to select the best shrimp!). 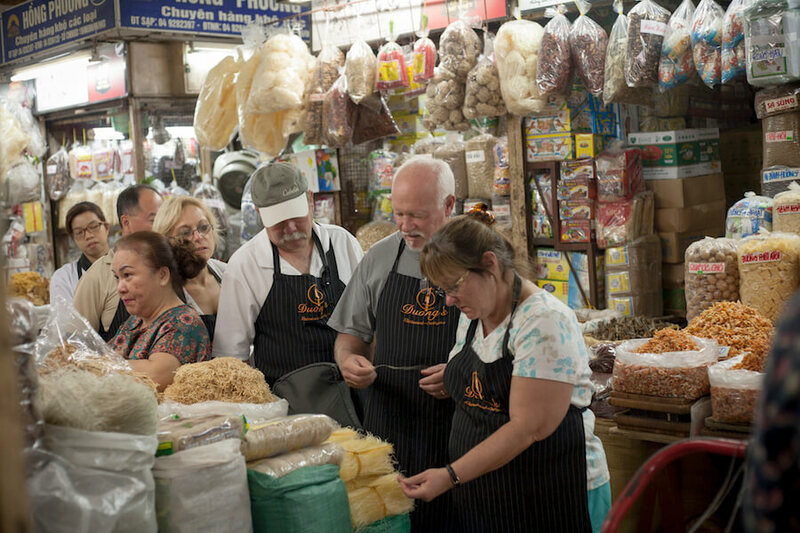 You'll find walking around the market delightful, as Chef Jack knows many of the sellers; you'll also enjoys sampling street foods, including exotic fruits. 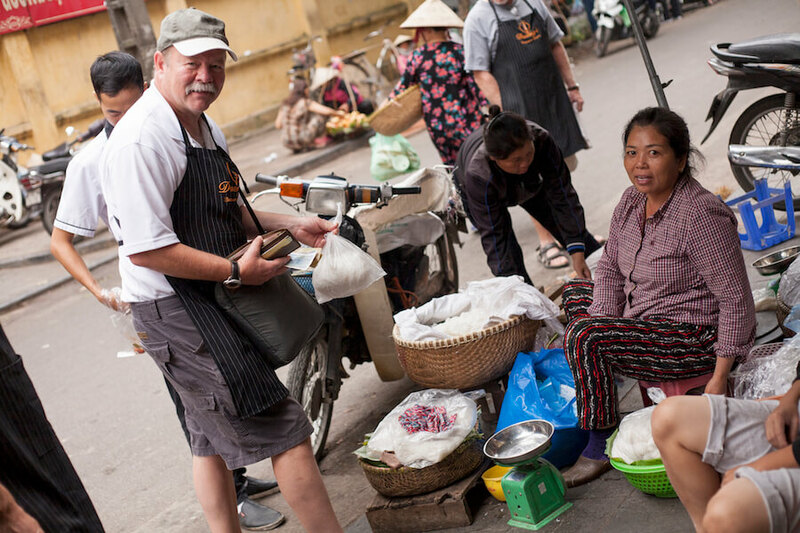 During the outing, Chef Jack will entrust you with his wallet as he guides you on how to make purchases and use the Vietnamese currency. Shopping can be hard work, so if the group is interested, we'll stop for a cold drink at a roadside bar before heading back to the restaurant to finish preparing lunch. Says one participant, "What a delicious meal we had, and what an unforgettable experience!" 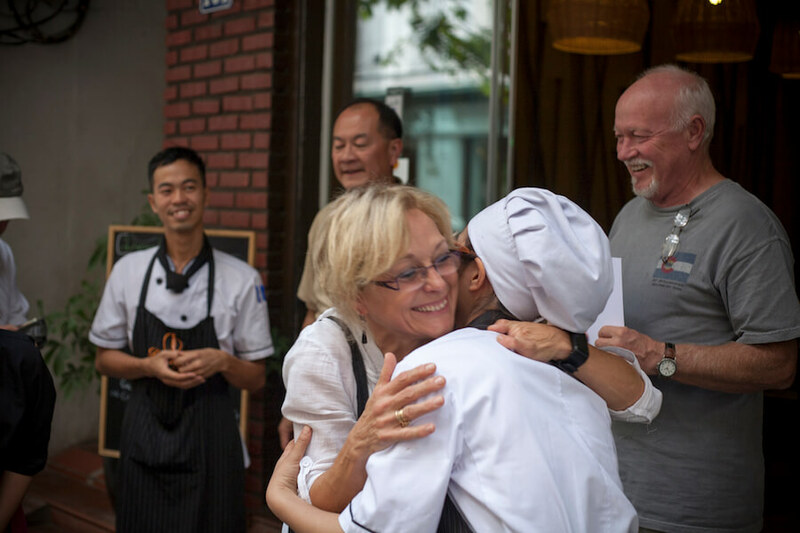 For your afternoon activity, you'll participate in the ‘Amazing Race,’ developed as a team-building activity to learn about the culture and life of Ha Noi in a fun, safe, and interactive way. After your Amazing Race adventure, we'll attend the famous Ha Noi Water Puppet Show and dinner. Dinner will be a Cha Ca “Fried Fish” dish at Quan Ngon Phan Boi Chau restaurant. Diners are seated in front of a coal cooking grill (two to three people per grill). Each grill comes with a frying pan for frying fish, to which you add vegetables, mint, and sauce. This is a very special Ha Noi dish, a must try before leaving the city.